With a high number of foreclosures still haunting homeowners, Jason Hartman and Chad Ruyle, principal and co-founder of YouWalkAway.com, discuss strategic defaults, homeowners’ rights, understanding the foreclosure process, and how homeowners can use the law to their advantage when their mortgage is in default. When should you walk away? How can you minimize foreclosure consequences? Listen in at: http://HolisticSurvival.com/category/audio-podcast/ for more information. Chad R. Ruyle has been interviewed by journalists for CBS 60 Minutes, ABC Nightline, The Today Show on NBC, Dylan Ratigan, and NBC Nightly News with Brian Williams to name a few. Ruyle is also a partner at the Law Firm of Ruyle& Ruyle in San Diego and has incorporated his extensive legal background into YouWalkAway.com. 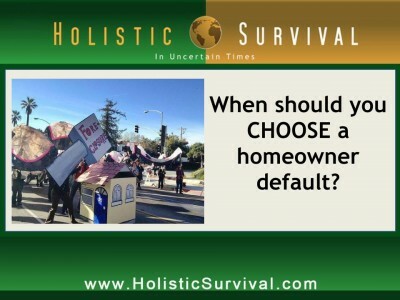 He sees mortgage defaulting as a business transaction not an emotional decision. Mortgage contracts are written with addressing potential foreclosures – clearly stating if the borrower ceases to make payments, the bank will take the house back. Ruyle focuses his practice on all areas of trusts and estates, business planning, and real estate transactions. Narrator: Welcome to the Holistic Survival Show with Jason Hartman. The economic storm brewing around the world is set to spill into all aspects of our lives. Are you prepared? Where are you going to turn for the critical life skills necessary to survive and prosper? The Holistic Survival Show is your family’s insurance for a better life. Jason will teach you to think independently, to understand threats and how to create the ultimate action plan. Sudden change or worst case scenario, you’ll be ready. Welcome to Holistic Survival, your key resource for protecting the people, places, and profits you care about in uncertain times. Ladies and gentlemen, your host Jason Hartman. Announcer: What’s great about the shows you’ll find on JasonHartman.com is that if you want to learn about some cool, new investor software, there’s a show for that. If you want to learn why Rome fell, Hitler rose, and Enron failed, there’s a show for that. If you want to know about property evaluation technology on the iPhone, there’s a show for that. And if you’d like to know how to make millions with mobile homes, there’s even a show for that. Yep, there’s a show for just about anything only from JasonHartman.com or type in “Jason Hartman” in the iTunes store. Jason Hartman: It’s my pleasure to welcome Chad Ruyle to the show today. He is with YouWalkAway.com and we are going to talk about the all popular and interesting topic today of strategic defaults and whether short sale makes sense, loan modification makes sense, foreclosure makes sense, and what people are doing out there. Obviously, all of you listeners know that people are very upset with banks and Wall Street right now and I think rightfully so. And Chad is actually an attorney and he started this site to help homeowners really understand their options. I think I’m describing that correctly, but I’ll let him do the rest. Chad, welcome. How are you? Chad Ruyle: I’m good. Thanks for having me on the show. Jason Hartman: My pleasure. Tell us a little bit about your background and how you came to get into this side of the business. Chad Ruyle: Well, my background is I’m an attorney and as an attorney I get a lot of questions and I’ll feel the law. And at around 2007 a lot of people were coming to me asking about their mortgage and the foreclosure process cuz there really wasn’t information out there. There weren’t attorneys or services out there to help them. So my business partner and I, John Maddox, we got together to start a site that you walk away to help these homeowners understand their rights, their options how to get through the foreclosure process in the best way possible. So these people were spending a lot of money on attorney fees or fly by night company sites that really didn’t offer any sort of help. They just took money up front and promised to do things, promised to modify loans and in the end didn’t really perform their service. Jason Hartman: Fantastic. So there has been just a lot of litigation, a lot of upset people who hired loan mod firms. A lot of these were attorney-backed – that’s the way they said it, attorney-backed, and I’m holding up quotes as I say that, Chad. And some weren’t at first and then there was a new law that was passed about charging upfront fees and all this kind of stuff. Is there a difference between what you do and those other loan modification firms? Chad Ruyle: Yeah. So what You Walk Away does, we don’t deal with the bank. We don’t do loan modifications. What we primarily do is help the homeowner first understand what their options are with the information we provide them. So what we provide is a You Walk Away kit that has all that information in there, it’s got form letters, we track their foreclosure and give them an update as to what’s going on. Part of the service is they get an attorney consultation within the state that they’re in, and we are a nationwide company. And they also get a consultation with a CTA for tax advice on the tax ramification. So we essentially help the homeowner understand their option and then, in going through foreclosure, understanding their rights, the timing, the ramification, but we also have a division that does short sales nationally as well. So we do help people with short sales. In regards to loan modifications, we don’t do them, we don’t deal directly with the bank. We just give information to the homeowner so that they understand if they should go that route and if they do what to expect and what the process is like. Jason Hartman: What is the sentiment of people out there nowadays? I mean certainly all of our listeners now have heard of the concept of strategic default. Should people walk away? Is that the best thing to do? And when they walk away, what’s the right way to walk away? I mean I think most walkaways are people living in their house for free for 2 or 3 years and then they’re taken out, everything including the kitchen sink and taking it with them. Chad Ruyle: Yeah. Well, I mean we certainly don’t recommend that. There’s some ramifications. But, yeah, in terms of the option, at first the homeowner has to decide do they want to stay in the property or not? Is it something that’s sentimental or location-wise their family’s there. And there’s a difference. And we’ll talk more about it but is it an investment property versus the owner occupied? Is it their residence? And so they first have to decide do they want to stay in the property or not? If they want to stay in the property, then that’s where the loan modification would come into play or if they could refinance, obviously most people aren’t able to because there’s not enough equity. So then they would look at a loan modification. The loan modification is very difficult. The banks are just extremely difficult to work with. They’re very slow-moving. It’s kind of a catch 22. You have to have enough income to show you can make the new payment, but you have to have little enough income that they want to work with you in lowering your payment, cuz obviously if you show too much income they’ll say well just keep paying this mortgage. Jason Hartman: And a comment on that, Chad, is that nobody seems to know what the magic number is. It seems to be this secret highly guarded underwriting criteria that only the people of the Bildeberg group know. I mean it’s like absurd that nobody knows what to do or how to qualify for a loan mod. It just seems like a big game. Chad Ruyle: Yeah, there’s really no magic number. The banks don’t even know themselves. Each loss mitigation department at each bank’s different and it just depends on who you talk to. I’ve seen all across the board different types of loan modifications where in one case they would say that doesn’t make sense or we won’t allow that and then months later the same thing they said they wouldn’t approve they approve. So with loan modifications, short sales, it’s just very difficult to deal with the bank because there’s just no logic there. And so if the homeowner, though, decides to get rid of the property, then their option would be a short sale foreclose on it – they’ll do the foreclosure process. The decision in that is really an effect on your credit. So there are certain ramifications of whether the bank can come at you for the difference or not – on short sales, the object is really to get the bank to sign off to agree that they won’t come after you for the difference. And so the short sale would be to help their credit. It’s much better than having a foreclosure on your credit. The process is that someone negotiate, like our company would negotiate a short sale with the bank and so if the property is only worth $200,000 and at the height it was worth $400,000, the loan was 100% loan like a lot of these and it was $400,000, then you’ve got that difference of $200,000 that has to be figured out with the bank. And so in that short sale process, the bank hopefully approves that new number, a reduction in principle, the properties sold, the bank takes that loss, homeowner’s out of the property, and it’s less an effect on their credit. So those are really the options, and again, depending on whether they want to stay or not and what their end goal is. Jason Hartman: Okay. So, Chad, talk for a moment about if they want to stay. So say someone wants to stay in the property, and of course we’re talking about homeowners now, not investors, but I’d like you to maybe parse that up a little bit too because there are some nuances that differ with investment properties versus your personal residence, right? Chad Ruyle: Yeah. So whether they stay or not, I mean the differences would be whether the bank has recourse, particularly in California – Arizona has similar laws where if it’s your residence and there’s a deficiency amount, in my example where the properties were $200,000 now and the loan was for $400,000, that deficiency of $200,000 with a residence there’s anti-deficiency rules where the homeowner would not owe the bank that difference by law. Jason Hartman: One distinction first. And that is providing it is a purchase money loan that has the deficiency, right? 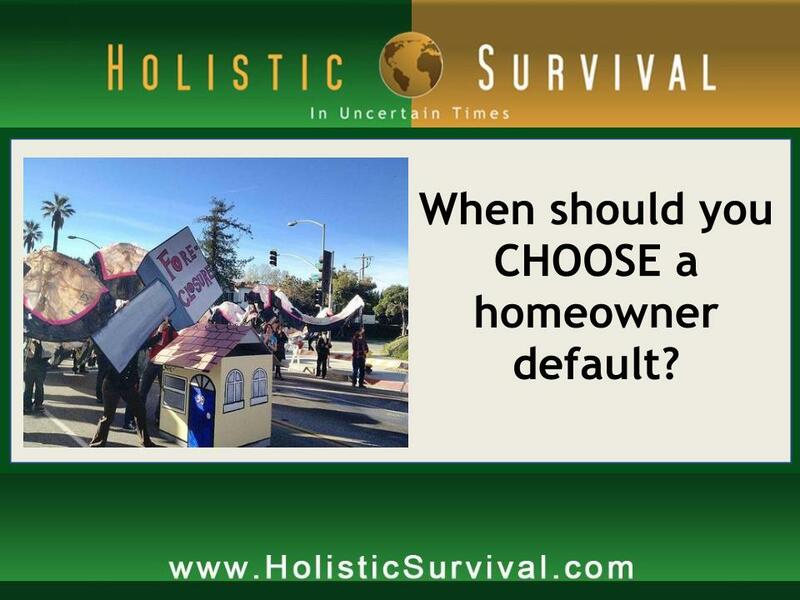 Because if that person refinanced or put a second trusteed on the house, then it can be recourse. Is that correct? I just wanted to make sure people knew. Chad Ruyle: Yeah, correct. But there could be a second that is a purchase money, because a lot of these loans, they had a first, the second was used towards the purchased. So yeah, if there’s a second that was not used towards the purchase, it was a home equity line – they pulled money out and used it for something else, then you’re correct. They’re not covered under the end of deficiency statute for that. Jason Hartman: So the listeners should understand that a purchase money loan just means loan proceeds that you use to acquire the property. If you refinanced it, even in a state like California that is a non-recourse state, that loan then becomes a recourse loan if you’ve refinanced, right? Chad Ruyle: Yeah, correct, correct. Jason Hartman: Wanted to make sure people knew that. Go ahead. Chad Ruyle: I mean that brings up a good point as well. What we’re talking about is the difference whether it’s an investor or it’s their residence. And so there’s more protection for a homeowner that lives in it. But at the end of the day, what we’re really seeing is it’s a question of whether the bank will come after the owner for the difference. So not talking law, we’re talking more of a reality, if the deficiency amount, and typically we’re seeing this where the first has been wiped out or has wiped out the second, whether that second lean will come after the homeowner. And a lot of times we’re seeing the bank not do that. We’re seeing them charge it off because the amount at the cost of them going through litigation in the fees are too much to try to recoup that difference. Jason Hartman: Right. And, Chad, that’s one of the things I’ve talked about in prior shows. And of course, listeners, you’ve got to be careful with this conversation here. You can’t hang your hat on this necessarily, okay? It’s just an opinion. Chad Ruyle: I’m just telling you in a lot of cases we see. But that’s not true in every instance. And that’s why I was gonna just follow up and say it just depends on the bank. It depends on the loan. It depends on the amounts that you owe, the deficiency amount. Jason Hartman: Right. But here’s my question for you, though, Chad. On that issue, if there really are 7 million people either in or on their way to foreclosure, and say we have that many foreclosures or some really high number, right, how would all of the banks sue all of those people? It just is a practical matter. It’s just not going to happen. Now, the problem is it may be you rather than your next door neighbor. So that’s why you gotta be careful. But here’s my question for you. How do you know that you’ve got a non-recourse deal? So say, for example, someone listening is in California, and it could be any state but let’s just use them as an example, and say the statute here, the law is that it’s a recourse because they have refinanced the property or say it’s in another state that is a recourse state and they haven’t refinanced so it’s recourse right away. So you do a short sale. How do you know that the lender, it’s always kind of hanging out there that maybe they have 4 years possibly to pursue the deficiency or two years or whatever the thing is in that state. Chad Ruyle: Yeah, each state has different statute of limitation on the recourse. Jason Hartman: So how do you know they’re not going to pursue it? Even though they have the legal right to, you could have that in the paperwork where you say you and the bank agree that there’s no recourse. Of course that’s one way to do it, right? Chad Ruyle: Yeah. So in a short sale, that’s typically what the realtor negotiator will try to do is get the bank to agree in a contract that they won’t come after them for the difference. But they don’t always do that and that’s kind of a negotiating point between the banks and the negotiator. But in terms of whether they will or not, like you said, you can’t hang your hat on it that they won’t, but you have to look at how aggressive the banks are. And that’s tough for an individual consumer or homeowner to know, but there are certain banks that we know of that are more aggressive than others in trying to recoup their deficiency. The biggest determining factor is really what’s the difference? If it’s a 30-40 thousand dollar difference, I’m not saying it won’t but it’s unlikely that they’ll come after a homeowner for that difference. The fees, the costs that are involved for them to try to recoup that, it just doesn’t pencil out for them to pursue an action against them. Jason Hartman: Right. And when you say pursue an action, of course that makes sense because anybody listening that has been involved in litigation knows that 30-40 thousand dollars in attorney fees, that happens pretty quick. So does the lender have to actually formally sue the borrower to recoup that deficiency or can they do it in a statutory manner or is there another way or is it just a full blown civil lawsuit? Chad Ruyle: Well, each speaks different. In some, it’s part of the foreclosure process and then they would actually file a claim for the deficiency amount and then get a judgment for that deficiency and have to pursue that. And some, it’s a separate action that the lender has to bring. It is a civil action that they would have to bring to recoup the difference. It’d have to go through that civil trial process and then get a judgment and then also have to enforce a judgment. So as many of your listeners probably know, the legal system isn’t cheap and it isn’t quick. So when the bank is looking at that lengthy, costly process, they’re gonna think twice about it if the deficiency amount is less if it doesn’t make sense financially for them to do that. Jason Hartman: I just wanted to clear a couple of those points up. But go ahead with what you’re saying. I got you off on a few tangents here and I apologize. But I just thought it was important for the listeners to know some of those things. So differences between investment properties and homes, did you kind of cover that? Chad Ruyle: Yeah. So with investment properties versus owner occupied, the main difference is the deficiency amount or the ability for the bank to come after the homeowner for the deficiency. But also it affects whether someone could get a short sale or a loan modification. The banks are not very willing to work with investors, investment properties because it’s a second property or a multiple property. They’re much more willing to work with an owner-occupied, to do a loan modification or a short sale. Jason Hartman: And I think part of the reason for that is just basic PR. I think the banks have a pretty bad image right now and they want to lessen if possible the number of people that are kicked out and talking on cameras and so forth or calling into talk radio shows. But I will tell you that the banks are so flipping confused and just disorganized it’s mind-boggling to me that half the time it seems like they don’t even know whether you’re occupying the property or not. They literally have no idea. I mean I have received letters in the mail on properties I own all over the country. And Bank of America is an attempt to justify the money they’ve taken, actually I should say stolen, from our government, us the taxpayers, in pretending that they’re willing to do loan modifications, right? They’ll say well we’re having an event in your area and the property’s in Georgia and they’re inviting me – they just have no clue what is going on and you can tell when you talk to their call centers and their processing people they just don’t even know. I mean these portfolios are so big and it’s just a mess. I mean you’ve certainly heard and read about the MERS system and what a disaster. I mean it’s just mindboggling what’s going on. Chad Ruyle: I’ve tried to understand it. And I think you’re certainly right. It really has to do with this whole department that was created, ’07 or around there, 2007, where they had in these departments for loans and securing loans and putting homeowners or people into homes and then they had to all of a sudden switch from that and get rid of all these people and take on a loss mitigation department. So it’s not a whole new department cuz they’ve always had a loss mitigation department, but they’ve had to increase it substantially. I couldn’t give you numbers. I don’t know how many new employees, which bank in loss mitigation departments, but any time a company or a department grows that quick and that large, there’s just gonna be chaos. You can’t do that. So I think part of it is this un-organization, this chaos that’s going on at the loss mitigation department at banks. And just to clarify, loss mitigation departments, those are the departments the people that a homeowner would talk with or negotiate with, that they’re trying to get a loan modification. They’d be talking to the loss mitigation department at the bank. If they’re trying to do a short sale, it’s also at the loss mitigation department. So they’re dealing with these people at the banks. A lot of them really don’t know what’s going on. So I think there is that chaos. I also think that these banks aren’t really willing to move through short sales and modifications quickly because I think then they’d have to write down these assets. So if they took it all on at once it would kill their balance sheets to show all these losses at once. Jason Hartman: That is a great point, Chad, and I’m glad you brought that up. The other thing I’d like to just ask you about that is it seems that the banks, and this is a purely anecdotal – I have no data on this, it’s just a perception. It seems that they’re more willing to do short sales than loan modifications. And I don’t know if that’s the way their assets are valued or the way the investors, they sell off the loans, are willing. I don’t know why it is exactly. I’ll probably come to understand it but at this time I don’t. Do you perceive it that way too that loan mods are harder to get than short sales? Chad Ruyle: I do. I think it’s what the bank is looking at, the reality they’re facing of someone doing a short sale versus a foreclosure, they’re further on in the process. So it’s kind of like the second step almost. They’ve tried a loan modification. Bank wasn’t willing to work with them, so now they’re in option 2 looking at short sale. I’m not saying that’s what happens all the time, but a lot of times that’s the process. And so when they get to that short sale, the bank’s looking at either a short sale or a foreclosure. And every time they go with the foreclosure route, they’re going to lose money because they have the cost and fees of going through the foreclosure, taking the property back, having to get the owner out of the property, and then the costs that are associated with it and the loss in value if there’s a depreciation. So they’re gonna be losing a lot more money if they go through the foreclosure versus going through a short sale because they reduced their cost and their fees. But going back to the irrationality of the banks, I’ve seen cases where people track workout a short sale for say $400,000 and the bank’s just not willing to budge. They’re not willing to go down to $400,000. The property goes to a trustee’s sale. So it goes through the foreclosure. Bank sells it as a trustee sale and they sell it for $340,000. So they’re selling it for $60,000 less than what they were unwilling to sell it for to a short sale. In addition to taking that $6,000 loss, they’re having to pay a lot more in costs and fees because they went further along in the process, so it just doesn’t make sense. Chad Ruyle: Now is your opportunity to get the Financial Freedom Report. The Financial Freedom Report provides financial self-defense in uncertain times. And it’s your source for innovative forward thinking investment property strategies and advice. Get your newsletter subscription today. You get a digital download and even more. The price, only $197. Go to JasonHartman.com to get yours today. Jason Hartman: So in terms of how someone should walk away or if they should walk away, maybe circle back around. We started talking about that. What are some of the other things they should think of? I mean, for example, Chad, does it ever make sense to just do the foreclosure? Does that sometimes make more sense than the short sale? I mean it hurts your credit more and I do want to ask you a little bit – I know this isn’t your specific area but you are involved with it – credit repair and credit restoration, because with a foreclosure, the person can stay in the house longer potentially, right? Chad Ruyle: Yeah. The determining factor is really their credit. So are they gonna buy a house in the near future? Do they need that credit for something? If they’re trying to save their credit, a short sale’s a better option. But a lot of these homeowners, they’ve already ruined their credit, they’re not looking to buy anytime soon, and the process of going through a short sale is a lot more involved, a lot more difficult than just letting it foreclose. And as you pointed out, going through the foreclosure process, typically they get to stay in the home a lot longer than a short sale. Jason Hartman: One thing I just want to mention there if I may, I know I said that and what you are saying is interesting and it’s right, but sometimes the short sale is used as a gambit to sort of string the lender along and delay the foreclosure. So sometimes you actually stay longer if you’re doing the short sale or at least pretending to do the short sale. Chad Ruyle: Sure. There people use it as a tool, like you said, to stay in the property longer. They pretend that they’re going to be doing a loan modification or short sale, but most of the people we see, they’re really trying to work something out with the bank and the banks just aren’t cooperating. So going through the foreclosure, I know people that have stayed in their properties for 2-3 years without paying a rent, without paying property taxes, so they’re living essentially rent free. And from a financial perspective, because they weren’t as concerned about their credit, made much more sense to go through the foreclosure than it did to try to short sale the property. Jason Hartman: Can people get their credit repaired? Can they fix up their credit after one of these experiences? Chad Ruyle: Yeah. So on the credit side of it, there’s two areas. One is the score and one is the report. And they work together, but their difference is that the score can be recovered fairly quickly. And when I say fairly quickly a year or two, sometimes sooner. But that score can get back up to what they had before, but on the report which is the information, kind of a history or timeline of their credit relationships, the foreclosure’s gonna be on there for up to 7 years. So a bank might see a good score, but they could look at the report, see a foreclosure on there and make a decision not to lend because they saw that foreclosure. But outside of that, that score is gonna be recovered relatively quickly. Jason Hartman: So are banks looking at the report closely? Because most people talk in terms of scores. They just say my FICO score is this with Experian, that with Trangian and that with Equifax or tri-merge which means the merger of the 3 reports together. My middle score is X. And, by the way, you may have a commentary on this as an aside. I think that 650 is the new 720 when it comes to credit scores nowadays. Chad Ruyle: Yeah. And that’s a good point, too – I’ll go back to your first point. But on the point of the relativity of scores now, I think both things have changed, how they score and also the lender’s perception of that score because there’s so many people that defaulted on their mortgage and missed payments and people that had trouble with credit cards and missing those payments that you have a larger percent of the population that has lower scores. Jason Hartman: It’s a bell curve, it’s a bell curve. Chad Ruyle: It’s a bell curve. Exactly, I was just gonna say that. So it’s the perception of the score but it’s also score itself that’s changing. No one knows how they scored exactly. It’s based on a lot of different factors. But in terms of the score and looking at foreclosure, your credit in foreclosure, a lot of the people we deal with, we advise them if you’re not gonna pay your mortgage and you’re concerned about the foreclosure when having a credit, take that money you’re saving if you can, some people can’t but if you can, use part of that to pay off your credit card debt. Credit card debt we’ve heard that balance is roughly 30% of your score, the effect on it. So there’s ways to use the foreclosure and the savings there to your advantage to try to build that score back up. Jason Hartman: That’s similar to what I had predicted, I think correctly now looking back. When consumer spending went up like a year ago last spring and the Obama administration was bragging about the recovery, yeah sure, I said at the time this is just simply people who aren’t making their mortgage payments going to the shopping mall. It’s a matter of people using money they would otherwise be paying the mortgage with to spend. Chad Ruyle: Yeah. There was a Bloomberg article recently, but I don’t think it’s aired yet. But I just interviewed with Fox News and the piece was on that. What are people doing with the money that they’re saving by not paying their mortgage? A lot of the people that we see are using it responsibly but obviously there’s people that are just spending it unwisely. But I think there is an effect on the economy because there’s money that’s being saved by not paying a mortgage and they can go out to eat more, they can spend it on trips, and so when that free ride ends and I’m paying the mortgage, then that money’s gonna be taken out of the economy. Jason Hartman: Yep. I couldn’t agree more. And that’s what happened during the re-fi boom when all these lenders were giving these liberally ridiculous loans is that a large part of the country’s GDP was basically coming from people re-fiing their homes and buying stuff. That wasn’t a real production. It was simply cycling fake equity into the shopping mall, the car dealership and the travel agent. Chad Ruyle: It’s kind of like the foreclosed properties, the REOs where investors were buying those up that the realtors and that industry was pointing you those numbers to say, look, the housing market is recovering, people are buying again. But those weren’t real buyers. Those were mainly investor groups or investors. But on that point, and as it relates to everything we’re talking about, there’s a difference of the homeowner who can make the payment but they just decide because they’re so far upside down, they’re underwater, it’s not worth it. So those are strategic defaulters where they’re just deciding, look, it’s not financially in my interest to continue paying a mortgage on a property I paid $400,000 for that’s worth $200,000. I’m not gonna recoup that for many, many years, a difference between them and then the homeowner who just can’t afford it. They aren’t making enough money. They lost their job, lost income, whatever the reason. But people differentiate the two, but you also have to look at kind of the grey area where someone might be considered a strategic defaulter and people say well they can afford it, they have enough income. But that might mean they’re not putting money towards savings or they might have to take money out of their retirement funds. They’re not paying for certain needs and things to their family. So at the cost of their family, their future, they would be able to continue making the payment. So there’s definitely a grey area I think between a strategic defaulter and then just a homeowner who absolutely can’t afford that payment. Jason Hartman: Well, the original question on that kind of started out as the difference between the score in the report on someone’s credit. And you were going to get to this and I know you’re working your way there, but are the lenders really looking at the reports closely or is it score based? Chad Ruyle: You know, I couldn’t say for sure. I mean each bank’s different. But most of them, they look at the score, that’s what they go off of. It just depends on the size of the loan and the procedure of the bank. But it’s mostly looking at the score, but I know the banks in certain cases will look at the report as well to see if there’s a foreclosure on the record. Jason Hartman: Can you fix that? Can it be removed or is that pretty impossible? You see all these ads and all these companies that some seem rather hokey to say the least that say they can fix your credit. I mean what is the real success rate in that kind of stuff? Chad Ruyle: You know, I couldn’t give you percentages. Your walkaway doesn’t do that. We don’t file law suits or try to get foreclosure off the record. But just in my experience in hearing of different cases, it’s definitely successful. It’s not something that happens most of the time. I can say that. But I’ve seen people that for whatever reason or whatever violations that are there from RESPA/TILA violations, they’re able to get the bank to take the foreclosure off the record which significantly helps their score. Sometimes people will hire attorneys or companies to try to do that, credit restoration companies to try to fix that. There’s games that people play with the bank of demanding that they produce the note which essentially is showing them the loan documents that they actually have them in hand, asking or requesting that many times and then the bank not complying, that they forced them then to remove the foreclosure off their record. So it definitely works, but I think a homeowner going into the decision, foreclosure, short sale, loan mod, or continuing to pay, they shouldn’t bank on them getting a foreclosure off their record. Jason Hartman: Very good point. In other words, don’t hang your hat on it. Well, Chad. What else do you want people to know about this whole area? What haven’t we covered in this talk? Chad Ruyle: Well, the question I get asked most by the media is the moral dilemma or ethical dilemma of someone who walks away and strategically defaults. So, again, they owe more than the house is worth, and from a financial perspective it doesn’t make sense. There’s this idea that no matter what you pay your mortgage. That’s your obligation, that’s your word. But in my view, and if you look at the contract, it’s different than a credit card debt which is just a guaranteed that you’re gonna pay that back. There’s no collateral in the property. In a mortgage, it’s a business transaction where there’s collateral and the bank in their agreement is lending you the money and if you don’t pay that money back they get to take that property. So you’re not breaking your word or your bond or the contract doing anything illegal. You’re fallen in terms of the contract to where if you don’t pay it – it doesn’t say if you can, it just says if you don’t pay this mortgage, then we’ll take the property back. And they head their bets with interest rates. They head their bets in other ways with certain credit defaults swaps and other investments, and also banks that should have been in a position to know better. They’re the ones who created these loans, sold them off many, many times in mortgage backed security. So obviously we wouldn’t feel bad for the banks, but in this business transaction, I think it’s completely ethical for a homeowner to decide to give the property back. They obviously have certain ramifications with credit, possible decision for you that they owe. But they have to look at it as a financial decision. They can’t just be bound of these payments because someone says that it’s a moral obligation. Jason Hartman: And, you know what, I have to say that I agree with you. My attitude has chained pretty significantly on this because at the beginning of a financial crisis when I was less informed than I am today, I really sort of thought what are all these people whining about? They got lucky. They got to move into a house that they couldn’t otherwise have afforded. They got to live there for 3-4 years, and now they’re complaining that they’re getting kicked out on the street and the media never asked the question, when they reported those stories, did you ever really deserve this house in the first place? Before this, you were living in a 2 bedroom apartment. Now you’re living in a 4 bedroom really nice Mcmansion or pseudo Mcmansion. It’s sort of all relative. People just looked at it as though oh they lost their home. But they never looked at what level the home was. And so I still think that, but on a larger picture with what you said that the bank has agreed that this is the business deal. Here’s the collateral. It’s not an installment, it’s not a credit card debt. If I don’t pay or I can’t pay, you get the collateral back. And that is simply a business deal. It’s the same way people use corporations and LLCs in the broader business world. Shipping and exploration of the earth would have never been done if someone didn’t invent the corporation. There probably would have never been a Columbus or any of those explorers, right? And so that’s the business deal. The liability goes only to the property. And there is certainly a large school of thought that believes that the banks engineered this whole crisis in the first place. We did an article in my newsletter, The Financial Freedom Report, about Goldman Sachs and how they’re the great bubble machine. And they always seem to profit ultimately from these bubbles where they go in and they pump up asset values, they loan on them and this is all the behind the scenes stuff that goes on in the Wall Street world. They loan on them, they use credit default swabs, they use all these other vehicles, they sell off the loans to Fannie Mae which means the taxpayers ultimately foot the bill through taxes and inflation and debt. And then they go in and buy the assets up cheap later. And everybody’s credit’s been destroyed. And then they get to have an excuse to charge them higher rates on loans in the future because their credit is now worse off and most people just buy into all of that, that grand scheme without ever fighting back and trying to fix their credit or trying to consider strategic defaults and so forth. So it’s a much more complex problem. And you can slice and dice this a zillion different ways, but I’m glad you brought up that moral question because it’s a good one. Chad Ruyle: I’d like to follow that up by saying I do think there’s a responsibility on the homeowner. I mean certain people abuse the system, they lie into getting and securing a loan by falsifying their income. They pulled out seconds and didn’t spend the money wisely. So I think there’s the response on the homeowner. But if you look at morality, it’s really looking at someone’s intentions, not the act itself – that’s important to me at least. And so in this situation we’re really just looking at a legal contract and what they’re doing with it they’re not breaking their word as they said, they’re following the terms. To give an example, people, just after explaining, that still don’t feel it’s quite right, I ask them if they have a cell phone contract say with one big carrier, they don’t like that carrier’s coverage or whatever reason they want to switch, people wouldn’t think twice about moving to another carrier if the penalty was suitable. So they’d pay a $50 penalty, $100 penalty. Get out a deal, move in a new carrier, and they understood the penalties that were there. The carrier set those penalties cuz they know people are gonna move and cancel their contracts before the term. So when I asked them that they said, well yeah, I wouldn’t have a problem doing that. I’ve done that. I canceled my carrier. There are other examples like that. Jason Hartman: You made an intelligent business decision because it was worth it to pay the penalty. And so in the case of strategic default, the penalty people pay as, number 1, it can be a big hassle, number 2, their credit is damaged, number 3, it can be a hassle to fix the credit, and they ultimately lose the collateral of the property. And, like you said, Chad, there will always be people that abuse every system. There are bad people out there that really take advantage of things. There’s no question we all know that’s true and that is going to happen. But in the case of the mortgage world, this whole game and everybody knew it in the early 2000s and the mid-2005 area when it was just getting really frothy, that the whole system was set up as a corrupt system where everybody along the line from the mortgage broker who gave you the loan was making commission and didn’t really want to know if you could afford the house. The whole system was set up that way. It was designed that way. And it wasn’t like the borrower. A lot of these lenders went out to people that they knew could not afford these properties and pushed loans down their throat. It’s a pretty multi-faceted problem. Chad Ruyle: The responsibility and the cause I think is all the way from the homeowner all the way up to the top politician and everywhere in between, from the homeowner, the mortgage broker, the bank, the investment, the loss of securities, the legislators that created new laws to allow for no dock, no money down, these new loans that were pushed back in the other direction towards the homeowner. So I think all across the board there’s blame but you really have to look at where do we want to burden or who do we want to burden? And I just get frustrated when people just keep arguing that it’s the homeowner’s responsibility 100%, they have to pay it. I really believe the burden is on the bank. They’re the ones who went into this eyes wide open. They’re the ones that got money from [INAUDIBLE]. They’re the ones that should have head their bets better. So that’s where I really think that the burden lies. Jason Hartman: I agree. Well, hey, this has been a really interesting discussion. Chad Ruyle, it’s YouWalkWay.com and, Chad, we’re gonna do some special offer or something on our page for you and the services your company offers and that’s JasonHartman.com/offers. So, again, check out JasonHartman.com/offers and thank you so much for joining us today. I really appreciate the insights and the learning more about intelligence strategic default which is what you help people do. So I appreciate having you on the show.